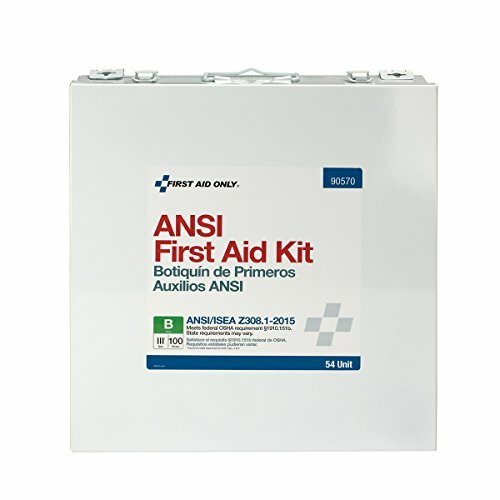 View More In First Aid Kits - Page 4. (4) 1-008: Fabric Bandages, 1" x 3", 16ct(1) 90638: 1 First Aid Tape, 1 CPR Mask, 1 Scissors(1) G460: Triple Antibiotic Ointment Packets, 25ct(5) 12-018: BZK Antiseptic Towelettes, 10ct(2) 16-004: Burn Dressing, 4" x 4"(1) G343: First Aid/Burn Cream Packets, 0.9g, 25ct(2) 21-004: Cold Compress, 4" x 5"(2) 7-009: 1 Eyewash, 1oz, with 2 Eye Pads and 2 Strips(2) 7-008: Eyewash, 1oz(1) 750013: Hand Sanitizer Packets, 0.9g, 10ct(2) 21-026: Nitrile Exam Gloves, 4 CT(1) B204: Conforming Gauze Roll, 2", 2ct(1) 3-001: Gauze Dressing Pads, 3" x 3", 4ct(4) AN205: Trauma Pad, 5" x 9", 1/box(2) 4-006: Triangular Sling/Bandage, 40" x 40" x 56"(1) 5-800: Sterile Gauze Bandage, 4"x4yd(1) 336007: Padded Splint, 4" x 24"(1) 17-011: Tourniquet(1) 350001: First Aid Guide. If you have any questions about this product by First Aid Only, contact us by completing and submitting the form below. If you are looking for a specif part number, please include it with your message.